Last time I wondered whether a set-up like WordPress.com meets FaceBook with add-ons (such as wiki- and latex-support) might be a usable environment for people working in a specific arXiv-topic. I’ve used WordPressMU and BuddyPress to create such an embryonal environment. At first I thought I’d extend it a bit before going online but I fail to have the energy right now so I might as well make the link available. If you are into math.QA and/or math.RA you are invited to join the experiment. But, please use this site gently as I’ll have to drop it otherwise. I’ve no desire to maintain this site indefinitely but would welcome others to set up something similar. For this reason I’ll write a couple of posts explaining how you can build it yourself when you’d have a free afternoon and a spare Mac around. Each post should not take you longer than 1 hour. Today, we’ll provide the boring but essential basics : we must get a MySQL-server and a WebServer running. Next time, I’ll take you through the WordPressMU (MU for multi-users) and BuddyPress installation. After that, we’ll add extra functionality. From left to right : the Finder, Terminal, Safari, TextWrangler and System Preferences. From now on we will mean by ‘Open …’ that you click on the ‘…’ icon. In the end we want our computer to become a web-server, so we don’t want it to go to sleep. Open SystemPreferences and look for the ‘Energy Saver’-icon, click on the ‘Show details’ button and set the ‘Put the computer to sleep when it is inactive for:’ to Never and unmark the ‘Put the hard disk(s) to sleep when possible’ at the bottom. We will need to start or stop the WebServer so here’s how that’s done : open SystemPreferences and look for the ‘Sharing’-icon. Marking the ‘Web Sharing’ option is equivalent to starting your webserver (you can verify this by opening Safari and pointing it to http://localhost/ and you should see the default Apache-screen), unmarking it stops the webserver (check this by repeating the previous, now you should get a ‘Safari can’t connect to the server’ message). All of this was probably trivial to you so let’s do something a bit more advanced : setting up a database-server. 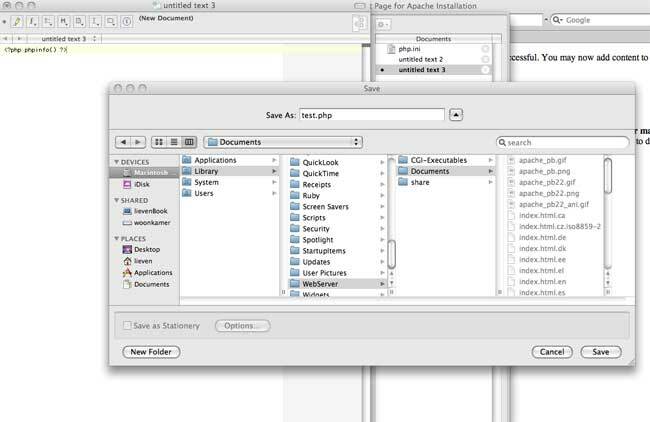 OSX doesn’t come with MySql, so we need to download and install it. 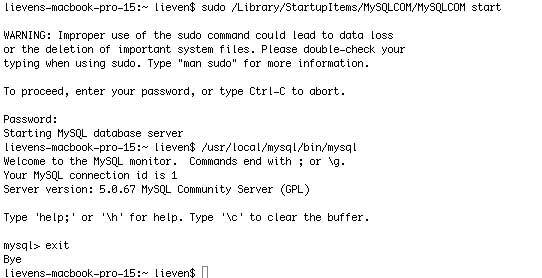 Click on the mysql-5.0.67-osx10.5-x86.pkg icon and follow the instruction (defaults suffice, you’ll be asked to give your sudo password and in all it will take less than a minute). Repeat this procedure with MySQLStartupItem.pkg. Done! and type exit to the mysql-prompt to leave. and giving your password. Okay, so we’ve established our first goal, we have a working Mysql. Take a break if you need one. 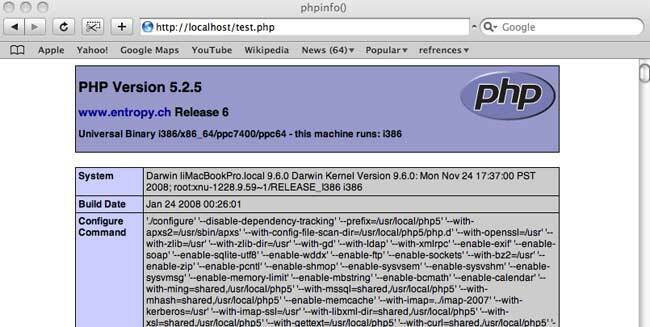 Mac 10.5 comes equipped with php5 but unfortunately it isn’t quite up to what we need. So, we need to install a better one and tell the mysql-server and the webserver to use the new one instead of the standard one. (observe that line 114 is commented out, that is, starts with a #, whereas your added line is not). Save the file (Textwrangler will ask you to provide the sudo-password). and now choose under ‘File’ the ‘Save as…’ option. In the window change php.ini-recommended to php.ini and click Save. Done! Restart your webserver. Recall that this means: open SystemPreferences, choose ‘Sharing’, unmark ‘Web Server’, wait 5 seconds and then mark it again. Finally, open Safari and point it to http://localhost/test.php. Cross your fingers and if you get a screen like the one below treat yourself to something nice! Next Post can -oids save group-theory 101?